Dr. Justine Lee is a board-certified emergency critical care veterinary specialist and toxicologist. She is the CEO and founder of VETgirl, a subscription-based webinar & podcast service offering online veterinary continuing education. Previously, she was the Associate Director of Veterinary Services at an animal poison control center in Minneapolis, MN and was on faculty at the University of Minnesota College of Veterinary Medicine. Dr. Lee graduated veterinary school from Cornell University, and completed her internship at Angell Memorial Animal Hospital, part of the Massachusetts Society for the Prevention of Cruelty to Animals (MSPCA). In addition, Dr. Lee completed an emergency fellowship and residency at University of Pennsylvania. Currently, Dr. Lee is one of approximately 450 board certified veterinary specialists world wide in emergency and critical care, and is a Diplomate of the American College of Veterinary Emergency and Critical Care (DACVECC). She is also board-certified in toxicology and is a Diplomate of the American Board of Toxicology (DABT). Dr. Lee has been published in numerous veterinary journals, including the Journal of American Veterinary Medical Association, the Journal of Veterinary Emergency Critical Care, and the Journal of Veterinary Internal Medicine. She is one of the editors and authors of The Five Minute Veterinary Consult Clinical Companion: Small Animal Toxicology textbook (Wiley, 2010) and the Veterinary Clinics of North America Small Animal: Emergency Medicine textbook (Elsevier, 2013). Dr. Lee has also published several veterinary book chapters, and has been aired on radio and television to promote preventative medicine, animal health, and the overall well-being of pets. Dr. Lee is the author of two humorous pet reference books entitled It’s a Dog’s Life… but It’s Your Carpet and It’s a Cat’s World… You Just Live In It. 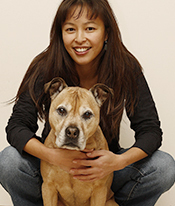 Previously, Dr. Lee was the pet columnist for Prevention magazine and blogger at "PetMD’s: The Daily Vet." Dr. Lee lectures throughout the world on emergency and critical care, and recently was honored with “Speaker of the Year” at the North American Veterinary Conference (2011, 2015) and the Association des Médecines Vétérinaires du Québec (2012). A rescued tortoiseshell cat named Lily – her first ever female pet in her life!